After many years of cleaning in my aviary with chlorine bleach I discovered Pet Focus. Now my birds and I can breathe easy when cleaning day arrives. Don’t let the pleasant smell fool you for a minute. 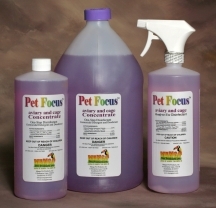 Pet Focus packs a punch against more pathogens than bleach. And when purchased as a concentrate, Pet Focus costs less than bleach to use. The Most Complete Avian Disinfectant! Effective against over 50 pathogens including viruses, (including Avian Polyomavirus that is resistant to severe environmental conditions) fungi and bacterial microbes. Pet Focus Aviary and Cage Disinfectant Cleaner is a quaternary disinfectant blended with a proprietary formula of surfactants to break down bird poop. Certified safe around birds, reptiles, dogs and cats. Pet Focus kills gram negative and gram positive bacteria. Safe guards against cross contaminations. Spray on, wipe off or air dry! Safe on cages. Just rinse to use on feeding dishes or syringes. Less time you need to spend cleaning and more time with your bird. Pet Focus is EPA certified as a rinse free formula. It is non-fuming and is a neutral pH concentrate formula. Question: When I mix the concentrate as directed, the solution isn't purple, it's clear. Why? Question: The label of Pet Focus says not to use on utensils and your brochure says it is okay to use to soak my syringes, which information is correct? Answer: Both are correct. Our formula is certified as a no-rinse. This feature is important to you as a bird owner because Pet Focus is non-toxic when air dried. You don't have to rinse. This feature is the premise of the label, therefore, all of our label instructions according to labeling laws must be worded according to those instructions. You can use Pet Focus on syringes, dishes, utensils etc. but they must be rinsed before using. Question: Do I have to remove my birds from the cage when using Pet Focus? 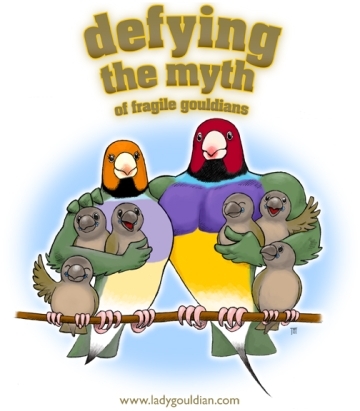 Answer: Pet Focus is EPA approved to be safe for birds…all birds…all sizes. We do recommend that if used for aviaries or cages when birds will not be removed, it is best to sponge on and wipe off Pet Focus. I would recommend this for any cleaner, as no living creature likes to have cleaner sprayed on them. Question: Do I need to wear goggles and gloves when using Pet Focus? Answer: Pet Focus is as safe as it gets for birds and people. Its no rinse formula means it leaves no harmful residue when let to air dry on cages. It is also a neutral pH meaning that it won’t burn skin but the warnings are on the label as it will remove fatty oils from the skin like dish soap will. All cleaners are required to put warnings on labels. All disinfectants must have these warnings as do bleach and other household items. Even bleach is corrosive and has warnings of goggles and gloves. MIXING DIRECTIONS FOR CONCENTRATE: add 1 fluid ounce to each gallon of water. Material Safety Data Sheet for Pet Focus, available upon request.